Ο Χρήστος Δουλκερίδης είναι Επίκουρος Καθηγητής στο Τμήμα Ψηφιακών Συστημάτων του Πανεπιστημίου Πειραιώς. Έχει λάβει υποτροφίες Marie-Curie και ERCIM “Allain Bensoussan” για μεταδιδακτορικές σπουδές στο Νορβηγικό Πολυτεχνείο Επιστημών και Τεχνολογίας το 2011 και 2009 αντίστοιχα. Πριν από αυτό, έλαβε διδακτορικό τίτλο σπουδών καθώς και μεταπτυχιακό τίτλο σπουδών από το Οικονομικό Πανεπιστήμιο Αθηνών το 2007 και το 2003 αντίστοιχα, και δίπλωμα ηλεκτρολόγου μηχανικού και μηχανικού ηλεκτρονικών υπολογιστών από το Εθνικό Μετσόβιο Πολυτεχνείο το 2001. Βραβεύθηκε ως δεύτερος νικητής του διαγωνισμού “Μιχάλης Δερτούζος” σχετικά με το “Ανθρώπινο Πρόσωπο της Πληροφορικής” στο 14ο παγκόσμιο συνέδριο World Congress on Information Technology (WCIT’04) το 2004. Τα ερευνητικά του ενδιαφέροντα περιλαμβάνουν “Big Data”, διαχείριση δεδομένων στο υπολογιστικό νέφος, επεξεργασία επερωτήσεων, διαχείριση δεδομένων σε δίκτυα ομότιμων κόμβων, κατανεμημένη εξόρυξη γνώσης, διαχείριση δεδομένων στον Παγκόσμιο Ιστό, κινητές και χωρικές βάσεις δεδομένων. Έχει δημοσιεύσει το ερευνητικό του έργο σε κορυφαία διεθνή περιοδικά (μεταξύ άλλων VLDB J, IEEE TKDE, IEEE J-SAC, ACM TKDD, Elsevier Information Systems, Springer DPD) και συνέδρια (μεταξύ άλλων ACM SIGMOD, VLDB, ICDE, EDBT, SSTD, PKDD, SIAM SDM) στις περιοχές διαχείρισης δεδομένων, εξόρυξη γνώσης και κατανεμημένων συστημάτων. Georgoulas K, Vlachou A, Doulkeridis C, Kotidis Y, “User-centric Similarity Search”, IEEE Transactions on Knowledge and Data Engineering (TKDE), Vol. 29, Issue 1, pages 200-213, 2017. Gkorgkas O, Vlachou A, Doulkeridis C, Nørvåg K, “Exploratory Product Search using Top-k Join Queries”, Information Systems, Vol. 64, pages 75-92, 2017. Pertesis D, Doulkeridis C, “Efficient Skyline Query Processing in SpatialHadoop”, Information Systems, Vol. 54, pages 325-335, 2015. Doulkeridis C, Nørvåg K. “A Survey of Large-Scale Analytical Query Processing in MapReduce”, VLDB Journal, Vol. 23, Issue 3, pages 355-380, June 2014. Vlachou A, Doulkeridis C, Nørvåg K. “Distributed Top-k Query Processing by Exploiting Skyline Summaries”, Distributed and Parallel Databases (special issue on Ranking in Databases), Vol. 30, Issue 3-4, pages 239-271, August 2012. Vlachou A, Doulkeridis C, Kotidis Y. “Metric-based Similarity Search in Unstructured Peer-to-Peer Systems”, Transactions on Large-Scale Data- and Knowledge-Centered Systems, Springer, Vol.5, pages 28-48, 2012. Vlachou A, Doulkeridis C, Kotidis Y, and Nørvåg K. “Monochromatic and Bichromatic Reverse Top-k Queries”, IEEE Transactions on Knowledge and Data Engineering (TKDE) (special issue Best of ICDE’10 papers), 23(8), pages 1215-1229, August 2011. Neumayer R, Doulkeridis C and Nørvåg K. “A Hybrid Approach for Estimating Document Frequencies in Unstructured P2P Networks”, Information Systems, 36(3), pages 579-595, May 2011. Magdalinos P, Doulkeridis C, Vazirgiannis M. “Enhancing Clustering Quality through Landmark-based Dimensionality Reduction”, ACM Transactions on Knowledge Discovery from Data (special issue on Large-Scale Data Mining: Theory and Applications), 5(2), February 2011. Doulkeridis C, Vlachou A, Mpestas D, Mamoulis N, “Parallel and Distributed Processing of Spatial Preference Queries using Keywords”, Proceedings of 20th International Conference on Extending Database Technology (EDBT’17), Venice, Italy, March 21-24, 2017. Saouk M, Doulkeridis C, Vlachou A, Nørvåg K, “Efficient Processing of Top-k Joins in MapReduce”, Proceedings of IEEE International Conference on Big Data (IEEE BigData’16), Washington D.C., USA, December 5-8, 2016. Nikitopoulos P, Paraskevopoulos A-I., Doulkeridis C, Pelekis N, Theodoridis Y, “BigCAB: Distributed Hot Spot Analysis over Big Spatio-temporal Data using Apache Spark (GIS Cup)”, Proceedings of 24th ACM SIGSPATIAL International Conference on Advances in Geographic Information Systems (ACM SIGSPATIAL 2016), Francisco Bay Area, California, USA, October 31 – November 3, 2016. Karanasou M, Ampla A, Doulkeridis C, Halkidi M, “Scalable and Real-time Sentiment Analysis on Twitter Data”, Proceedings of 6th ICDM Workshop on Sentiment Elicitation from Natural Text for Information Retrieval and Extraction (SENTIRE’16), Barcelona, Spain, December 12, 2016. Sfyris G.A, Fragkos N, Doulkeridis C, “Profile-Based Selection of Expert Groups”, Proceedings of 20th International Conference on Theory and Practice of Digital Libraries (TPDL’16), pp.81-93, Hannover, Germany, September 5-9, 2016. Gkorgkas O, Vlachou A, Doulkeridis C, Nørvåg K, “Maximizing Influence of Spatio-Textual Objects Based on Keyword Selection”, 14th Hellenic Data Management Symposium (HDMS’16), Athens, Greece, July 28-29, 2016. Doulkeridis C, Vlachou A, Nikitopoulos P, Tampakis P, Saouk M, “The RoadRunner Framework for Efficient and Scalable Processing of Big Data”, Proceedings of 19th Panhellenic Conference on Informatics (PCI’15), pp.215-220, Athens, Greece, October 1-3, 2015. Gkorgkas O, Vlachou A, Doulkeridis C, Nørvåg K, “Maximizing Influence of Spatio-Textual Objects Based on Keyword Selection”, Proceedings of 14th International Symposium on Spatial and Temporal Databases (SSTD’15), Seoul, South Korea, August 26-28, 2015. Gkorgkas O, Vlachou A, Doulkeridis C, Nørvåg K, “Finding the Most Diverse Products using Preference Queries”, 13th Hellenic Data Management Symposium (HDMS’15), Athens, Greece, July 20-21, 2015. Karanasou M, Doulkeridis C, Halkidi M, “DsUniPi: An SVM-based approach for Sentiment Analysis of Figurative Language on Twitter”, Proceedings of 9th International Workshop on Semantic Evaluation (SemEval 2015), Denver, Colorado, June 4-5, 2015. Gkorgkas O, Vlachou A, Doulkeridis C, Nørvåg K, “Finding the Most Diverse Products using Preference Queries”, Proceedings of 18th International Conference on Extending Database Technology (EDBT’15), Brussels, Belgium, March 23-27, 2015. Vlachou A, Doulkeridis C, Nørvåg K and Kotidis Y. “Branch-and-Bound Algorithm for Reverse Top-k Queries”, 12th Hellenic Data Management Symposium (HDMS’14), Athens, Greece, July 2014. Gkorgkas O, Vlachou A, Doulkeridis C, Nørvåg K, “Efficient Processing of Exploratory Top-k Joins”, Proceedings of 26th International Conference on Scientific and Statistical Database Management (SSDBM’14), Aalborg, Denmark, June 30 – July 2, 2014. Liknes S, Vlachou A, Doulkeridis C, Nørvåg K, “APSkyline: Improved Skyline Computation for Multicore Architectures”, Proceedings of 19th International Conference on Database Systems for Advanced Applications (DASFAA’14), Bali, Indonesia, April 21-24, 2014. Gkorgkas O, Vlachou A, Doulkeridis C, Nørvåg K, “Discovering Influential Data Objects over Time”, Proceedings of 13th International Symposium on Spatial and Temporal Databases (SSTD’13), Munich, Germany, August 21-23, 2013. Vlachou A, Doulkeridis C, Nørvåg K and Kotidis Y. “Branch-and-Bound Algorithm for Reverse Top-k Queries”, Proceedings of ACM International Conference on Management of Data (SIGMOD’13), New York, USA, June 22-27, 2013. Doulkeridis C, Nørvåg K. “On Saying “Enough Already!” in MapReduce”, Proceedings of 1st International Workshop on Cloud Intelligence (Cloud-I 2012, co-located with VLDB’2012), Istanbul, Turkey, August 31, 2012. Rocha-Junior J, Vlachou A, Doulkeridis C and Nørvåg K. “Efficient Algorithms for Top-k Spatial Preference Queries”, 11th Hellenic Data Management Symposium (HDMS’12), Chania, Crete, June 2012. Vlachou A, Doulkeridis C and Halkidi M. “Discovering Representative Skyline Points over Distributed Data”, Proceedings of 24th International Conference on Scientific and Statistical Database Management (SSDBM’12), Chania, Greece, June 25-27, 2012. Doulkeridis C, Vlachou A, Nørvåg K, Kotidis Y, Polyzotis N. “Processing of Rank Joins in Highly Distributed Systems”, Proceedings of 28th IEEE International Conference on Data Engineering (ICDE’12), Washington DC, USA, April 1-5, 2012. Vlachou A, Doulkeridis C, Polyzotis N. “Skyline Query Processing over Joins”, Proceedings of ACM International Conference on Management of Data (SIGMOD’11), Athens, Greece, June 12-16, 2011. Vlachou A, Doulkeridis C, Nørvåg K. “Monitoring Reverse Top-k Queries over Mobile Devices”, Proceedings of 10th ACM International Workshop on Data Engineering for Wireless and Mobile Access (MobiDE’11), Athens, Greece, June 12, 2011. Vlachou A, Doulkeridis C, Polyzotis N. “Skyline Queries over Relational Joins”, 10th Hellenic Data Management Symposium (HDMS’11), Athens, Greece, June 2011. Vlachou A, Doulkeridis C, Nørvåg K and Kotidis Y. “Using Reverse Top-k Queries for Identifying the Most Influential Data Objects”, 10th Hellenic Data Management Symposium (HDMS’11), Athens, Greece, June 2011. Rocha-Junior J, Vlachou A, Doulkeridis C and Nørvåg K. “Efficient Processing of Top-k Spatial Preference Queries”, Proceedings of 37th International Conference on Very Large Data Bases (VLDB’11), Seattle, WA, August 29 – September 3, 2011. Ryeng N, Vlachou A, Doulkeridis C and Nørvåg K. “Efficient Distributed Top-k Query Processing with Caching”, Proceedings of 16th International Conference on Database Systems for Advanced Applications (DASFAA’11), Hong Kong, April 22-25, 2011. Rocha-Junior J, Vlachou A, Doulkeridis C and Nørvåg K. “Efficient Execution Plans for Distributed Skyline Query Processing”, Proceedings of 14th International Conference on Extending Database Technology (EDBT’11), Uppsala, Sweden, March 21-25, 2011. 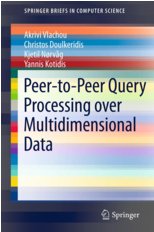 Vlachou A, Doulkeridis C, Nørvåg K, Kotidis Y. Peer-to-Peer Query Processing over Multidimensional Data. In Springer, 2012.